There’s something deliciously decadent about heading out of the city on a Monday morning, when everybody else is heading to work/school/stuff. One of the joys of funemployment is that I can. While it sometimes means working over weekends, it’s totally worth it. Last Monday, we headed to McGregor, just two-and-a-bit hours from Cape Town. It was a beautiful day to drive out there. We arrived to sweltering heat. Really, really sweltering, but were welcomed by the lovely Jenny at Le Bonheur. After dumping our luggage in our spacious en-suite, separate entrance room, we headed into the main drag in search of a cold drink. How Bazaar provided just such a thing – grape juice made locally. We sat outside on the covered stoep, admiring the garden. It was cooler inside, but the lure of the gorgeous garden was too much. Suitably refreshed, it only seemed right to do some exploring, so we ambled hotly through the oven main road, up to the Tourism Office and tiny museum within it, marvelling at the church diagonally opposite. I’m glad we made it, because it’s choc-a-block full of old bits and bobs from McGregor’s past and has a wonderful book detailing McGregor’s history by local, Gerrit Davids, who sounds like a character and a half. He leaves no scandal or triumph untold. Edna Cox, in whose house the mousetrap and sickle were found, seems like a woman nobody (and no mouse) should mess with! And then we were too hot to continue, so had to take ourselves back to the oasis that is Le Bonheur – me to repose on my bed beneath the fan, GM to splash about in the pool in Le Bonheur’s fabulous garden filled with little creatures. Well, I reposed until I had to flop onto my belly, in order to have my massage by the fabulous Atholl Hay. Now that’s Monday decadence. What a treat. As the sun set over the hills and the valley blushed in its glow, we ambled along the dust road and around the corner to The Sandbag House. Fiona, of Destination McGregor (who also helped organise our trip), cooks amazing 3-course meals, usually on a Sunday, but on a Monday for us, opening her and husband, Tom’s gorgeous home to visitors. They had set a table out under the trees in the garden, from where we could watch the sky turn pink and the almost-full moon rise, along with newest (and fabulous) McGregor local, Dennie, who joined us for dinner. I had sworn it was going to be an early night, having had a particularly busy on call shift ending that morning, but the company was too good, the food too delicious, and the common threads (Rhodes, Zimbabwe, a love of travel and Africa) were too lovely, so we stayed much later than ‘early’, revelling in it all. We left having made three new friends, which can only signify a very good night. A short walk back to the comfort of Le Bonheur, under a star-filled sky was the perfect end to a perfect day. Mondays in McGregor are to be recommended. Tuesday will be the next blog. And is also to be recommended. Do you see a theme here? McGregor ‘town’ is set on a gentle hill. A really gentle one. The main road is tarred and easy to negotiate, How Bazaar equally so, although, if you want to go into the garden, there’s a small step. Nothing a helping hand won’t negotiate. The tourism centre and museum has a ramp up to it and is completely flat inside. The museum itself is a small room, but perfectly navigable. Fiona’s Sandbag House has a bit of a steep driveway, which we coped with fine using the Freewheel, and if the driveway is too much, it is possible to arrive by car and get out at the top of the driveway. Once there, it’s fantastic. Le Bonheur is a dream. It’s wheelchair-friendly, with plenty of space, a perfect height bed, and an accessible bathroom (no rails, but the basin is high enough to get under and the shower is level with the floor, with a plastic chair). Jenny, the host, is exceptionally lovely and very helpful. The only small challenge is the stone pathway to the room, but again, doable with the Freewheel, or a little help! It’s well worth it and Jenny’s cheese scones for breakfast are divine. 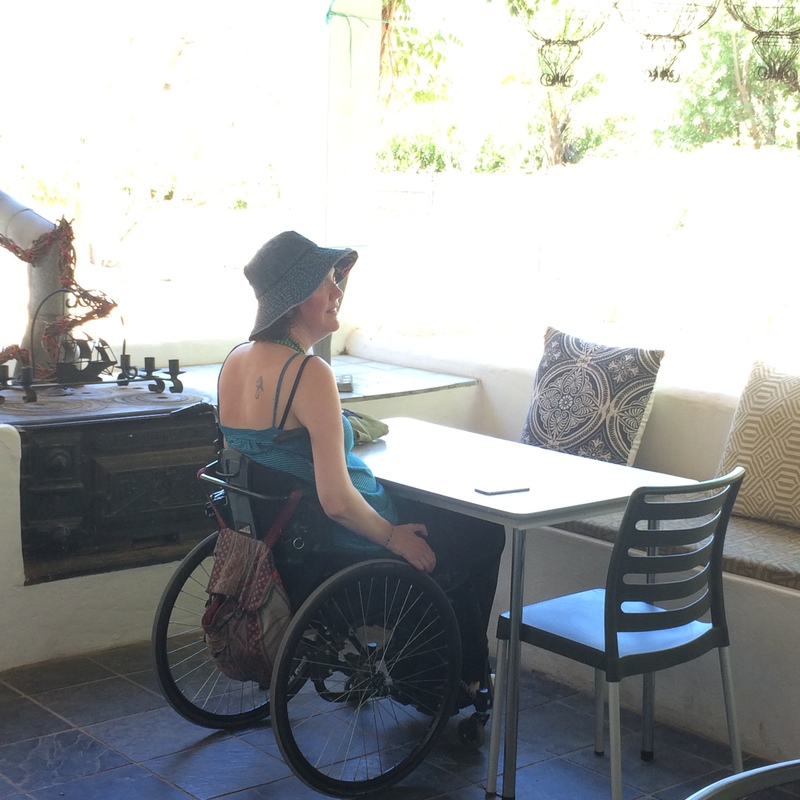 This entry was posted in Accessibility, Travel & Exploring and tagged Destination McGregor, Le Bonheur, McGregor, The Sandbag House, Universal accessibilty, Wheelchair. Bookmark the permalink. Ah, thank you, Briony, for this. So glad to have connected with you – as you say, so many comon threads – and that is one of the things that is so special about McGregor. Glad you enjoyed your Supper @ The Sandbag House, and I remain amazed at how you scooted your way through our maze to the bathroom!